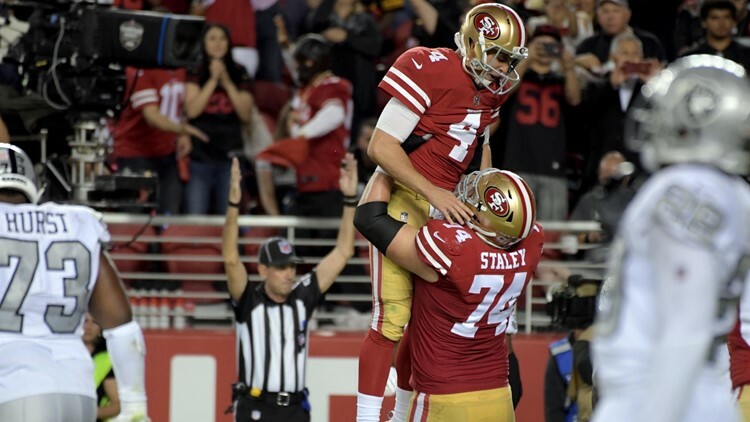 San Francisco 49ers offensive tackle Joe Staley (74) celebrates with San Francisco 49ers quarterback Nick Mullens (4) during the second half against the Oakland Raiders at Levi's Stadium. In his NFL debut, Nick Mullens threw for 262 yards and three touchdowns, leading the San Francisco 49ers to a 34-3 victory over the Oakland Raiders in a lopsided Battle of the Bay on Thursday night. SANTA CLARA, Calif. (AP) - Nick Mullens threw for 262 yards and three touchdowns for the most productive NFL debut since the merger, leading the San Francisco 49ers to a 34-3 victory over the Oakland Raiders in a lopsided Battle of the Bay on Thursday night.